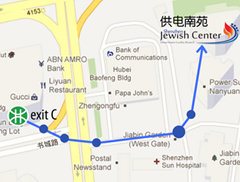 How to Get to Chabad Shenzhen from Hong Kong Airport? come to Shenzhen from HK Airport, if you can make to the Ferry Counter inside the Airport 1 Hour before the last ferry, namely by 8:30 PM. There are signs all over the place inside the Airport showing you how to get to the Ferry Transfer Desk after you arrive at the airport. It is located just before the immigration processing area as well as before the luggage pickup area. Taking the ferry to Shenzhen will by-pass entering Hong Kong altogether from the immigration point of view and the ferry will take you from the airport directly into China via the ferry port called Shekou in Shenzhen. After you purchase the ticket, you can give them the tags of your checked luggage and they will transfer them for you onto the ferry. Shenzhen metro (or Shenzhen subway) is a very important part of the Shenzhen transportation system. Shenzhen subway was first opened in December 2004. Up to now, Shenzhen metro system has 5 lines, 137 stations. And still there are 2 new subway lines under construction in Shenzhen. Want to go to Guangzhou by metro from Shenzhen? You can go take any of existing metro line in Shenzhen and get off at the Luohu station in Luobao line (also known as line 1). From the Luohu station, you can take the CRH (China Railway High-speed) from Shenzhen to Guangzhou which takes about 1 hour on the way and the ticket costs around 80 RMB. Riders can transfer to Hong Kong’s MTR East Rail Line for travel onward to Hong Kong easily as the Luobao subway line and Longhua subway line run to the border crossings between Hong Kong and shenzhen. Shenzhen metro is an important part in people’s life in this new and modern city.